Using this tool you can hide or show your previously made measurements, and the current measure status of the corners. This tool is a 3 state switch. the last status is to hide all measures. All rooms have a name in OrthoGraph. With this tool you can hide or show these room labels. This tool is a 3 state switch. the last status is to hide all room labels. the last status is to hide all reference lines. With this tool you can switch on or off the grid behind the floor plan. The grid has two grades, The thin lines are vertically and horizontally by 1 meter from each other, while the thick lines are in 5 meter intervals. Using this tool you can hide or show your previously set flooring. This tool is a 3 state switch. the last status is to hide all flooring. Using this tool you can hide or show your previously created labels. This tool is a 3 state switch. the last status is to hide all labels. Using this tool you can hide or show your previously created annotations. This tool is a 3 state switch. the last status is to hide all annotations. Using this tool you can hide or show your previously created objects. This tool is a 3 state switch. the last status is to hide all objects. 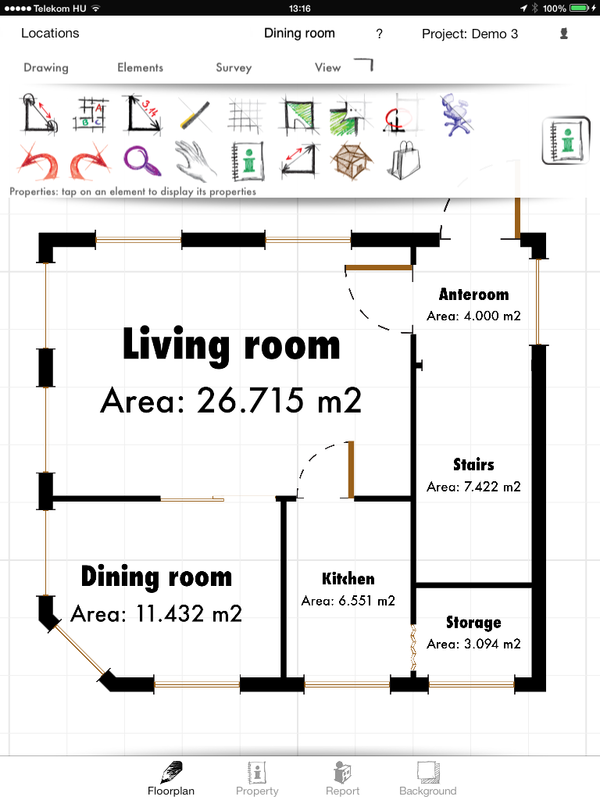 In OrthoGraph Architect you can view the floor plan created (and surveyed) in 3D. In 3D view mode you have 3 navigation tools, on the left, you have a joystick for going forward, backward, left and right (you have to move the circle in the middle to up, down, left and right respectively), and looking up, down, left and right with the joystick on the right. The third tool is a slider on the right edge of the screen, which is for lifting the viewpoint.